Number three in series experimenting with watercolor textures on Bristol plate. Inspired by 16C artist, Barocci, and his sketches which I enjoyed at the National Gallery in London. I actually thought there was more stand-out value in his simple drawings on toned paper. 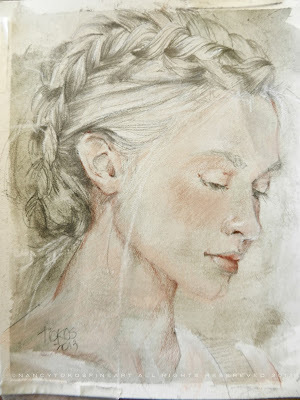 The grace of this pose and the delicate braids compliments the effect of a little conte crayon and tiny dots of white chalk highlights. This also makes an amazing portrait as 7x5 inches fits nicely on a bed stand.